Artificial (Fake) Baits, Boilies, Pop-Ups, Particle Baits (Such As Mielie Pips, XL Kaboem & XL Tiger-Nuts) & Hook-Bait Pellets. Superb hookbaits for big fish. Containing high levels of soluble fish proteins, potent natural attractors and proven fish feeding stimulants these innovative halibut pellets are pre-drilled, making them simple to hair rig. 50 Glugged Hookbaits per tub. This exciting product combines our high quality, nutrient-rich Equinox boilie with its matching concentrated bait dip ? all in one ready to use package. Being constantly soaked in their own powerfully bait dip, these irresistible 10 x 14mm dumbell hookbaits pack a real punch of attraction making them ideal for use over a bed of bait or as a single hookbait. We have taken our popular milk protein and bird food boilie mix, added the optimum amount of a superb new feeding stimulant and then rolled it into irresistible big fish-catching 10 x 14mm hookbaits, which are then supplied in a pot of concentrated bait dip. We have taken our all-conquering N-Gage XP boilie mix, added the optimum amount of a superb new feeding stimulant and then rolled it into irresistible big fish-catching 10 x 14mm hookbaits, which are then supplied in a pot of concentrated bait dip. We have taken our irresistible year round Fish and Green Lipped Mussel based boilie mix, added the optimum amount of a superb new feeding stimulant and then rolled it into irresistible big fish-catching 10 x 14mm hookbaits, which are then supplied in a pot of concentrated bait dip. Betaine is a proven appetite stimulant that encourages fish to feed more aggressively for sustained periods. These pellets contain very digestible fish proteins, a high fish oil inclusion and break down in approx 18-24 hours depending on water temperature. Four mixed natural colours pineapple flavoured. Bloodworm Red colour pineapple flavoured Buoyant Maggots, they can be used on their own or fished with natural baits or as a combination bait with real or artificial sweetcorn. 4 mixed flouro colours pineapple flavoured Buoyant Maggots, they can be used on their own or fished with natural baits or as a combination bait with real or artificial sweetcorn. 3 colour pineapple flavoured Buoyant Maggots, they can be used on their own or fished with natural baits or as a combination bait with real or artificial sweetcorn. Our Half Boilies help bridge the gap between an imitation and a real food source bait, and offer the angler an alternate to the popular snowman rig. By combining them with half a sinking real boilie 14 ? 16mm size, a ?wafter? hook bait can be achieved. Click here for more information on this product and to watch a video on Fake Artificial Baits. Our Hybrid Boilies bridge the gap between an imitation and a real food source bait, offering�an alternative hook bait. Designed to take a 10 to 12mm dia dumbell/pellet boilie they are ideal for use as a single standout hook bait, offering the angler a wide range of colour combinations and presentations. 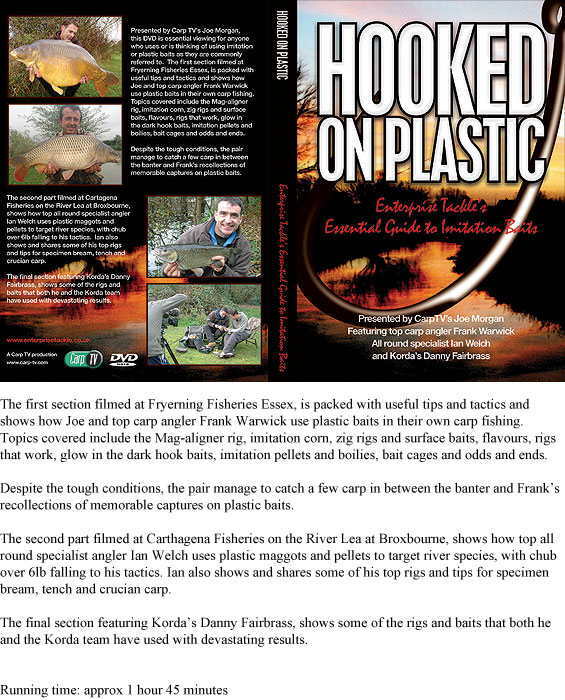 Presented by Carp TV's Joe Morgan, this DVD is essential viewing for anyone who uses or is thinking of using imitation or plastic baits as they are commonly referred to. Our imitation boilies have been designed to give the modern day angler maximum flexibility when creating rigs to fool wary fish. The inclusion of a hole into one side, (patent pending), enables weight to be added to create a critically balanced or sinking bait. Click here for more information on this product and to watch a video on Fishing with Imitation Baits. Betalin is the strongest natural sweetener available it can?t be overloaded and has a fantastic track record. Betalin has proven carp puller betaine dissolved down into it to add to its catching power and provides a lingering smell and taste even when baits have been left out for long periods. Mega Pop-Up Sweetcorn is a buoyant rubber imitation grain of corn. It is soft enough to be used on the hook if desired, but is best when used on a hair rig along with real grains of corn. Neutrally Buoyant Redworms in a concentrated worm flavour. The new "Classic Flavour Popup Sweetcorn Range" is a range of buoyant imitation corn hook baits in liquid flavour, incorporating some of the most successful flavours and additives of all time.